Two days ago, I was woken up by a strong sensation of something I need to do. I started writing about it and it came clearer. There is a huge need nowadays for mediation, deep meditation. Not everybody can guide and hold the space for a deep meditative experience, and I would not be able to do it without the help of Guru Ram Das. 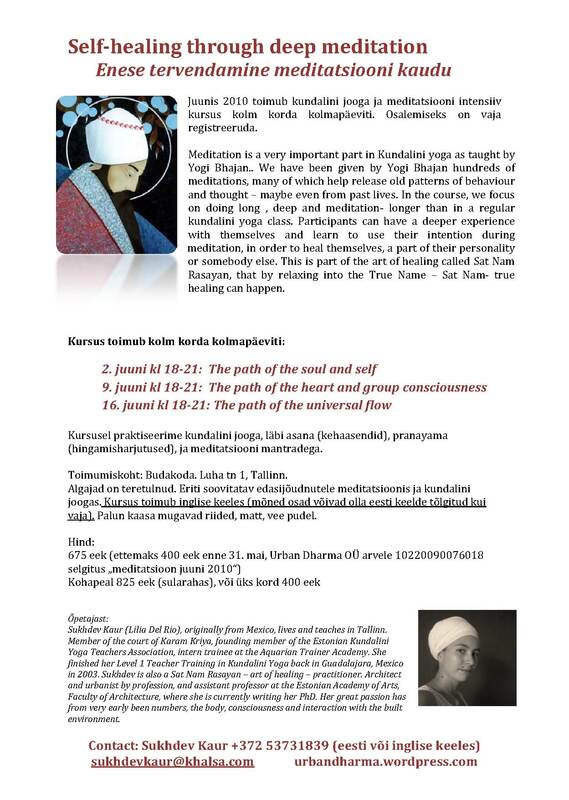 I am holding a course in the beginning of june, 3 hours, 3 days (on the 3rd day of the week) (3x3x3), where we will practice kundalini yoga and focus more on the meditative part, and aspects of healing through meditation. Everybody is welcome to join, but the course is specially recommended to those who have had experience before in kundalini yoga. The course will be held mostly in English, with some explanation into Estonian if needed.